Finding and removing duplicate objects. 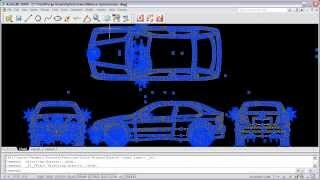 Finding and removing objects located in overlapping areas of other objects. Finding and replacing two or more co-directional objects forming an interface node with a single entity. Finding and replacing two or more co-directional objects partially overlapping each other with a single entity. Replacing serial collinear chains of same objects with a single object. Finding and removing redundant vertices in polylines (POLYLINE, LWPOLYLINE). Optimizing jointly and separately entities LINE, CICRLE, ARC and polylines POLYLINE, LWPOLYLINE. Properly handling entities located in different planes and ensuring 100% support for all user coordinate systems (UCS). High performance compared to existing competitors (OVERKILL). Finding and removing lines of short length. Finding and removing circles and arcs of small radius. Bridging gaps in various entity combination interface nodes (including those forming closed areas). Converting joint entities into multiple-vertices polylines (smart conversion). Converting entities forming closed loop into closed polylines. Option to convert entities into polylines on the “as is” principle (trivial conversion). Converting spline objects (SPLINE, ELLIPSE, POLYLINE) into optimized polylines LWPOLYLINE. Option to convert spline objects into polylines using approximation by both line and arc segments. Converting geometrically identical closed two-dimensional contours into a set of same-type blocks using the new efficient block creator. Optimizing data within blocks using all the above mentioned features. Converting objects into polylines within blocks using trivial and smart conversion methods. High performance when processing great numbers of blocks. Running in a dedicated thread. Synchronizing and bringing entity normal vectors to uniformity. Increased protection in data processing. All object manipulation procedures are carried out in hidden records. Improved rollback (undo) function, preventing corruption of data in case of abnormal termination of the application. Significant decrease of drawing file size (especially for large drawings consisting of numerous primary units) up to 15% and more. Accelerated performance when working with drawings (due to reduced drawing size) after optimization (especially when working with large drawings). Simplicity and ease of installation using the classic installer. Toolbar for quick and easy launching. Selection of both individual drawing fragments and all objects on current layout. Assigning new properties to objects prior to launching optimization. Automatic serial optimization of entities on all layers. These features make TotalPurge a perfect solution for cleaning and optimizing DWG drawings (especially when dealing with a large volumes of electronic documentation), as well as drawings obtained by exporting from engineering and graphic design suites, such as Autodesk® Inventor®, SolidWorks, SolidEdge, CorelDraw, etc. Trial Details: You can freely use this version for 30 days. After this trial period you must purchase a license to keep using TotalPurge. - Added support Autodesk® AutoCAD® 2018. - Fixed small issue in installer. A very long time I use this application, I knew the author before he published it in the store. When you get a drawing from the designers, and there's a lot of confusion. This application very much helps to put everything in order, and to reduce the weight of the drawing.